Black prayer ribbons representing the Orlando shooting victims will be included in this year’s Swim for Life & Paddler Flotilla in Provincetown. Year after year, the colorful prayer ribbons act as witnesses. Waving in the wind, they carry messages for loved ones who lost their battle with AIDS. “We left the porch light on. We’ll always leave the porch light on for you,” one reads. “Enjoy the journey,” another reads. The prayers are written on 2,800 six-foot-long strands of material during the annual Swim for Life & Paddler Flotilla in Provincetown. On Saturday morning, they will flutter from a dock as 400 people dive into the harbor to swim the 1.4 miles from Long Point to the boat slip. 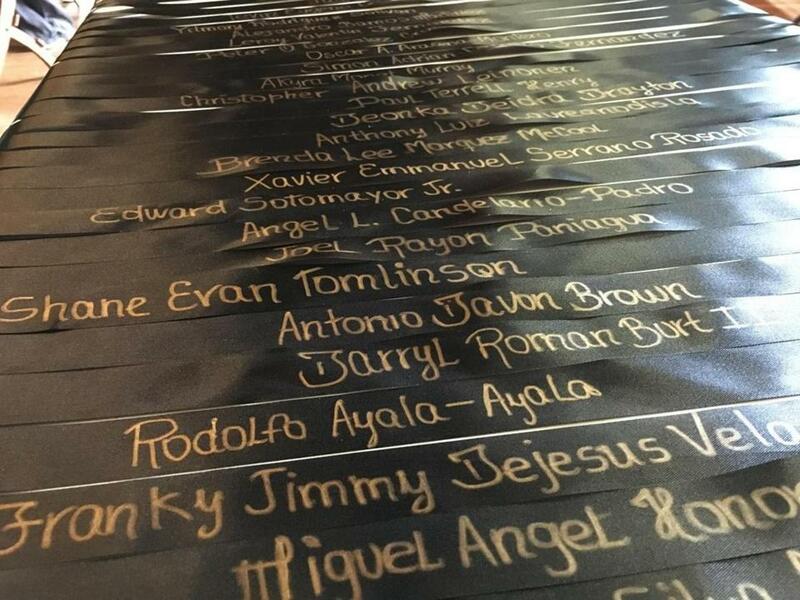 This year, amid the colorful tableau, there will be an additional 50 black prayer ribbons, one for every life lost in the Pulse Nightclub massacre in Orlando June 12 and an extra for the injured. Critchley, a performance artist and videographer, lived in Provincetown during the AIDS epidemic, a time when not seeing a friend on the street for a while made people wonder if he were dead. Loved ones went to the hospital with pneumonia and never left. Friends gathered for memorials every week, it seemed. On Sept. 6, organizers and participants gathered for a ceremony at Provincetown Town Hall. They read the name of each Pulse victim out loud. Frank Billingsley, chief of staff for Orlando Mayor Buddy Dyer, was present for the ceremony. His partner lives in P-town and they own a house on the Cape. He remembers weeping when he received photos of a ceremony held in Provincetown the Sunday night following the Orlando shootings.